Michael: Let's get started, our progression is based on the key of E, we'll use a I. IV, V progression common for most blues. Michael: Can you tell me what the chords would be? Michael: Here comes the tab for the progression on the jam track. Michael: Notice between the main riff how it follows the bass, the first progression has a descending chromatic line that resolves on the E before repeating. You can use the mouse to highlight and repeat any section of the interactive tab this will help you isolate a section that needs practice. 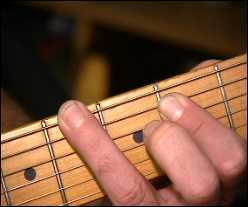 The coming guitar licks will use the Em Blues scale. 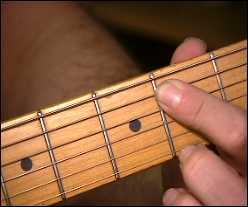 Michael: The first portion of this lick starts in the major pentatonic scale and jumps back to the open Em blues pattern. 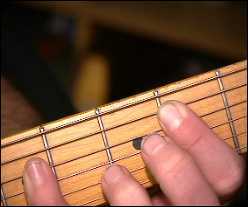 Michael: This uses more of the staccato type licks, this actually uses the major pentatonic scale pattern in the open position and then jumps back into the minor blues. skarz: Do you have to think about those scales while your playing or does it just flow? Michael: It helps to have the pattern envisioned in your mind, it's the foundation of all these licks and helps you jump between them quickly. Here's another lick that follows the V, IV, I.
skarz: What is the best way to memorize patterns, horizontally or vertically? ton: I can only memorize them vertically. skarz: So that last lick would be in 4th position right? Michael: Thanks Brian and Skarz! skarz: Man this is cool, I'm actually learning something. Michael: Yes, a turnaround ends the progression and can even be used to start a progression, one example is Red House, by Jimi Hendrix. skarz: Buddy Guy does that allot doesn't he? 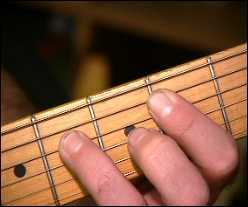 Michael: Now let's try a counter lick you can play over the progression. 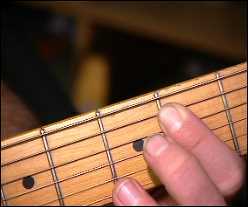 Michael: This is a great sounding lick! This lick kind of reminds me of Ted Nugent's "Hey Baby." Michael: Here are some pictures of how you can position your hand. Michael: The chords are actually based on the C#m and C#b5, kind of a cool finger-picking triad thing, it all comes together when you hear Lesson Sample at the beginning of the lesson.